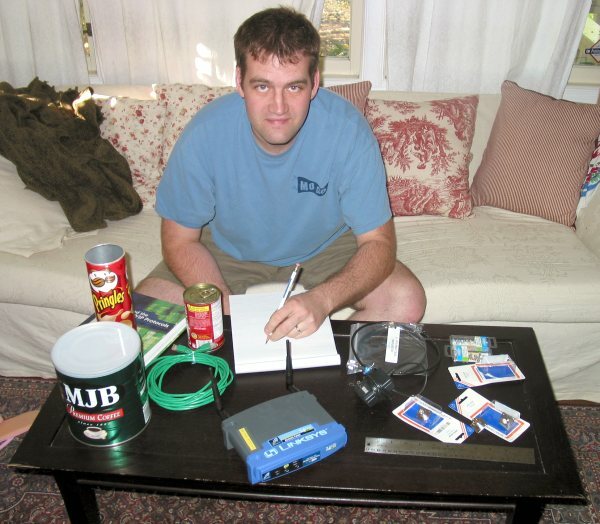 JJ Furman and I performed some experiments with antennas for 802.11b networking in April of 2003. This was part of JJ's continuing attempts to keep me busy while I was unemployed. All I can say to that is thanks, JJ! These experiments really helped keep my spirits up. Unlike the LifterExperiment, this experiment was kind of inconclusive. We didn't really get good quantitative results for how much the cantenna improved signal strength. However, we did show that it's easy to build one of these devices, and they do improve the range of your wireless networking. What's a cantenna, you ask? It's an antenna shaped like a can, of course! These antennas are used primarily to focus microwave energy. Instead of allowing the energy to spread in all directions, a cantenna focuses it into a narrow beam. The result is a stronger signal in the direction the cantenna is aimed. I talk about microwave energy above because that's the range that popular wireless computer networks operate in, right above 2ghz. Don't worry: the power is so low that you won't be harmed by it. Here I am planning the initial construction of the cantenna. The required parts are arrayed on the table. JJ did all the work of buying and acquiring the parts before we did the experiment, and we did the work at his house. Don't get the impression that this was my experiment - JJ thought it up and provided all the material and research.